Dessert is the triumphant closure of an elaborate dinner. It must be something special to capture the attention of the already sated eater. Hunger has long since dissappeared, all that is left is gratification of the senses. On this page is the recipe for strawberry soufflé with egg whites, the recipe for mint soufflé with eggs and a roux is on another page. Both recipes are from the famous French cook Marie-Antoine (Antonin) Carême. His life is a classic succes story. Carême had a difficult start. Having been born in a poor working class family with many children, he was put out on the streets of Paris at the age of ten because by then he was considered to be able to fend for himself. He found work in a restaurant. After six years he was discovered by the famous pâtissier Bailly. His new master instructed him in the arts of pâtisserie, but also enabled him to learn to read and write. After two years in the service of Bailly, he was again discovered, this time by Talleyrand. Carême went into service as pâtissier, but used his time well by learning the cook’s office from Talleyrand’s master chef Boucher. In the twelve years Carême was to work here, he cooked for many high personages like Napoleon Bonaparte and King Louis XVIII. After twelve years Carême left Paris for England, where he was to cook for the Prince-Regent (son of King George III, later King George IV). However, England did not agree with Carême, and in 1818 he was back in Paris. For a short while, because his next patron, Czar Alexander I, took him to Petersburg. 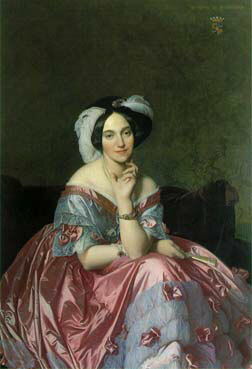 But Russia was no more to Carême’s taste than England was. After a stay in Vienna Carême returned to France. His new employees were James (1792-1868) and Betty Rothschild (1805-1886, see portrait on the left). The social acceptation of the ‘nouveau riche’ Rothschilds was due in part to the elaborate meals that were served at their table. In 1833 Carême died from a stroke after a lingering illness probably caused by tuberculosis and long-term exposure to carbon-monoxide. At the time there was a great cholera epidemic. 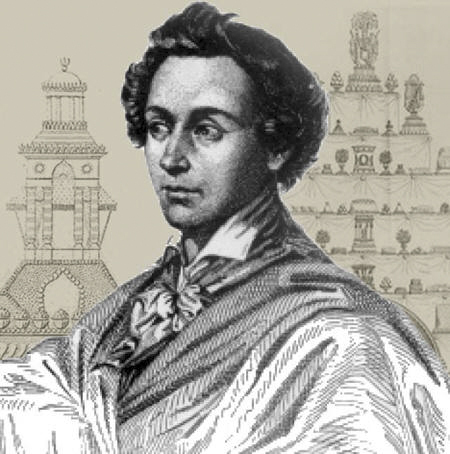 His remains were buried during the night, without ceremonial, at the then new graveyard Montmartre (opened in 1825), which was already filling up fastly because of the large number of cholera victims. It was to be years before a tombstone was placed on his grave, at first no one even knew the exact location of the grave. By the way, am I the only one who sees the irony of a famous cook with the surname ‘Lent’? Because that is what carême means: the forty day period of penance and fasting between Ash Wednessday and Easter. Carême has written a number of cookbooks during his life. The first two books concern his first love, pâtisserie: Le Pâtissier Royal Parisien ou Traité Elementaire et Pratique de la Pâtisserie Ancienne et Moderne and Le Pâtissier Pittoresque, both published in 1815. These books did not only contain recipes, but also architectural designs for sugar confectionary. To Carême sugar architecture was quite as serious as the designing of real buildings. In the Pâtissier Pittoresque there are plates illustrating for example the differences between Ionic, Doric and Corinthian columns. To him, pâtisserie was one of the branches of architecture. Pâtisserie is not only sugar and sweets, it also covers the territory of pasties and paté, so in these books you’ll also find recipes for savoury pasties and such. In 1822 Carême publishes Le Maître d’Hôtel Français, ou parelle de la cuisine ancienne et moderne, considérée sous le rapport de l’ordonnance des menus, selon les quatre saisons. With this book he displays himself as an alround cook. It contains an overview of meals which were served in the previous years in Paris, St. Petersburg, London and Vienna to a plethora of noble and important men and women. The next cookbook appears in 1828, Le Cuisinier Parisien. This focusses on recipes for cold buffets with dishes like aspic and chaudfroid. Although he was in poor health during the last years of his life, Carême worked hard to complete his chef d’oeuvre L’Art de la cuisine français au 19ème siècle. This encyclopedic work on classical French cuisine consists of five parts. The first three parts were published in 1833, the last two parts were finished by friend and colleague Plumerey when Carême died before being able to finish his great work. 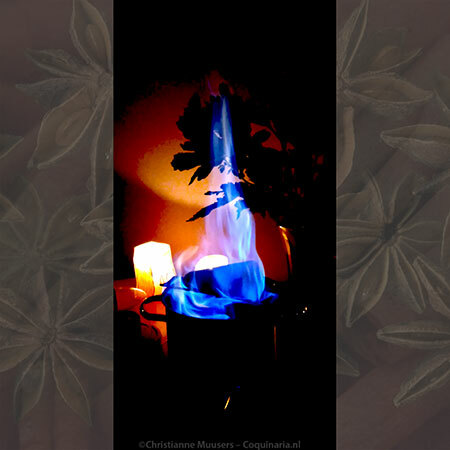 (See the printed biography of Carême, Cooking for Kings). Looking at the career of Carême, one can but agree with the saying that he was “le cuisinier des rois et le roi des cuisiniers” (cook of kings, and king of cooks). Back to the soufflé recipes. 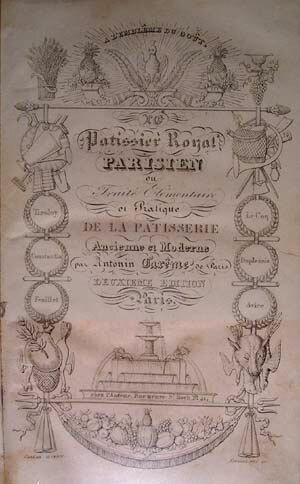 The source of the recipes is Le Pâtissier Royal. They are for sweet soufflés, meant to be served hot. But mind you, there are also savoury soufflés (like cheese-soufflé, broccoli-soufflé) and soufflés that are served cold. I have picked two recipes, to demonstrate the two basic preparations for these soufflés. The first recipe is based on pureed fruit, without fat or egg yolks, the soufflé parisienne. This results in a light, easily digested soufflé, but it collapses rather quickly. That is the Strawberry Soufflé on this page. The second recipe is based on milk or cream that is thickened with cooked rice or (more modern) a roux with flour, and egg yolks, the soufflé française. This soufflé is much firmer, but also less easy on the stomach (and our cholesterol and slim figures!). See the recipe for Mint Soufflé. Carême did not invent the soufflé, but he was one of the first to publish recipes for it. The dish soufflé dates from the end of the eighteenth century. Antoine Beauvilliers (1754-1817), once cook to King Louis XIV and later owner of the first real restaurant in Paris, Le Grand Taverne de Londres (since 1783), served many a soufflé in his career, although his L’Art du Cuisinier with the first soufflé recipes in print wasn’t published until 1814. To Carême the soufflé was “la reine de la pâtisserie chaude, ancienne et moderne” (the queen of hot pastry, old and modern). 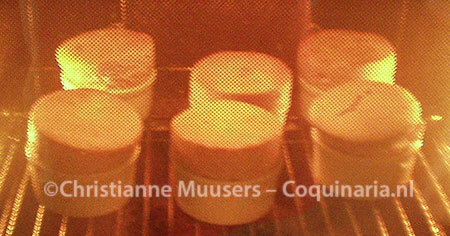 In his days soufflés were baked in a pastry case, called a croustade, that was lined with buttered sheets of paper. This pastry case was usually baked in advance. In my adaptation of the recipes I have not used a croustade, but a modern soufflé dish. These croustades were not only used for soufflé, pasties were also served in it. The correct preparation of the croustade was of great importance to Carême. That is why Le Pâtissier Royal starts with an extensive introduction describing the ins and outs of the making of puff pastry. Read what Carême had to say about dough . You can see from the original recipes that a soufflé is one of the more difficult dishes to prepare. If you work hazardly or hasty, you won’t serve a proudly raised soufflé, but a pathetic mess that no viagra will ever get to rise again! Soufflés purely based on puréed fruit without additional thickeners are the most susceptible to collapsing. Carême advises to use a portable field oven heated with glowing ashes for transportation, to keep the soufflés draught-free and warm. This is the text as found in Le Patissier Royal Parisien ou Traité Elementaire et Pratique de la Patisserie Ancienne et Moderne, second impr., 1828, pp. 364-365. The recipe for mint soufflé was even more verbose, it has its own page. Après avoir épluché un beau panier de belles fraises et de bon fruit, vous les écrasez. Vous les passez en purée à l’étamine fine; vous mêlez une livre et demie de sucre en poudre avec dix-huit blancs d’oeufs foutés bien fermes. Lorsque le tout et bien amalgamé, vous ys mêlez la purée de fraises parfaitement incorporée. Vouz verser l’appareil dans une croustade comme à l’ordinaire; vous terminez l’opération de même de ci-dessus. On procédera de la même manière pour faire des soufflés de framboises, de groseilles, de prunes de reine-claude et de mirabelle. Comme ces sortes de soufflés sont très-susceptibles à la cuisson, on les fait encore de la manière suivante: On prépare la moitié de l’appareil des soufflés français décrits précédemment; mais on n’y met que huit jaunes d’oeufs et peu de sucre. 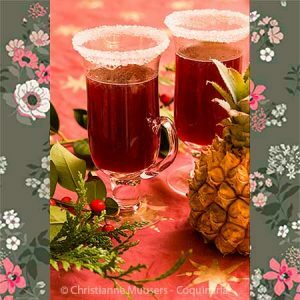 Ensuite vous mettez cet appareil avec l ‘une des trois recettes décrites ci-dessus; mais vous ne mêlez tout qu’apres avoir préparé entièrement le soufflé comme pour entrer au four. Le soufflé aux framboises se prépare de même qui celui-ci. After picking over a large basket of good strawberries and fruit, crush them. Strain them to a purée through a fine-meshed sieve. Temper one and a half pound of powdered sugar with eighteen stiffly beaten egg whites. When everything is well mixed, you mix in the strawberry purée until it is perfectly absorbed. Pour the preparation in a pastry crust as usual, complete the work the same way as [described] above. One proceeds in the same manner to make soufflé with raspberries, red currants, greengage plums and mirabelles. Because these kinds of soufflés are very susceptible to the baking, one makes them also in the following manner: One prepares half of the preparation for french soufflés described before; but one adds but eight egg yolks and a little sugar. Then you make this preparation with one of the three recipes described above, but you won’t mix all before you have completely prepared the soufflé up to the moment that it’s ready for the oven. The soufflé with raspberries is prepared in the same manner as this one. For the modern adaptation of this dish I have used the first method. The result is a wonderfully light soufflé. The second method is described extensively in the second recipe, for mint soufflé. On the picture below right you see six strawberry soufflés in individual moulds baking in the oven. This strawberry soufflé is really very easy to make if you follow the instructions. Nagerecht voor zes tot acht personen; voorbereiding 12 minuten; bereiding 40 minuten. If you make one large soufflé it is better to use a low, wide mould than a high, narrow one. I prefer to use small individual soufflé dishes. Don’t even THINK about opening the oven door while the soufflé is baking! Use a moderate heat to bake the soufflé. Serve the soufflé as soon as possible. This means that you have to time the moment the soufflé enters the oven rightly. Take care that during transport of the soufflé it is as warm and draught-free as possible. Separate the yolks from the whites (this is how you do that). Purée the hulled strawberries in a blender or a passevite. Add half of the sugar, taste, and add more sugar if you so desire. Butter the soufflé mould and sprinkle the inside with icing sugar. Preheat the oven to 175 °C/350 °F. Beat the egg whites until they stand up in peaks (see the tips & tricks). Add 50 gram sugar and continue beating the whites to a glossy whiteness. Add a little of the eggwhites to the strawberry purée, mix well, then pour the purée into the bowl with the beaten egg whites. Mix lightly, and pour the preparation into the buttered and sugared soufflé mould. For a good result the mould be filled almost up to the rim. Bake in the center of the oven for 25 to 30 minutes until slightly browned and concave on top. Sprinkle some icing sugar on the soufflé and serve immediately! You could garnish with slices of fresh strawberry, whipped cream, and maybe a sprig of mint (although that is rather cliché). Very simple: Pour the raw egg on the fingers of your (clean!) hand, and let the white run through your fingers. The yolk will remain wiggling on your fingers. If you absolutely must, buy an egg separator, but when nature has provided us with the perfect tool, why waste money? Other people use the eggshell halves to separate the yolk from the white, but these shells have sharp edges. How does one beat egg whites? Although this is wide-spread knowledge, I ‘ll state it here once more: a soufflé is made with beaten egg whites, and egg whites will never be stiff enough unless the eggs are at room temperature to start with, and all kitchen implements are absolutely fat-free. I live in a temperate climate, so my eggs never see the inside of a refrigerator anyway, but if you keep your eggs refrigerated, remember to take them out at least an hour before using them.. Crack the eggs one by one above a seperate bowl. If the yolk breaks you can’t use the white for the soufflé, and if you crack all eggs above the same bowl and the last yolk breaks, you’ll have to throw away all the whites. So you’ll need three bowls, one to break the eggs in, and two others to collect the separated yolks and whites. If you’re unsure whether the bowl is absolutely grease-free, just rub a slice of lemon in it, then rinse with water and dry with a clean cloth. Wild strawberries are smaller than ordinary strawberries, they smell delicious and taste even better. They are really worth your while to try and find them! However, if you do not succeed, use modern strawberries instead. The dish will be just as pink and almost as tasty (however, first sample a strawberry, because some strawberries only taste of water). Antonin Carême, Le pâtissier pittoresque Extraits choisis et presentés par Allen S. Weiss. Ed. Mercure de France, 2003. Antonin Carême, Le Patissier Royal Parisien ou Traité Elementaire et Pratique de la Patisserie Ancienne et Moderne, second edition, 1828 (with thanks to Joop Witteveen, who kindly allowed me to study his volume). Auguste Escoffier, Ma Cuisine (Sterling Publishing, 2001). Ian Kelly, Cooking for Kings: The Life of Antonin Careme, the First Celebrity Chef (Short, 2003 and other editions).